Blue jeans, white shirt, black leather jacket. These are the staples in every closet and with time they’ve each gotten their own sustianable avatar! Being the eco-fashion lovers that we are we of course we ensured to keep you up to date with the latest trends in sustainable denim. Be it Pharrell Williams partnership with G-Star Raw or W.Y.L.D.E’s eco chic fashion featuring a lot of denim wear, we made sure you were always updated with whats in vogue in the sustainable denim front. So how can it be that we leave out updating you all that went down at world’s biggest denim festival DENIM DAYS that held it’s first New York edition recently! 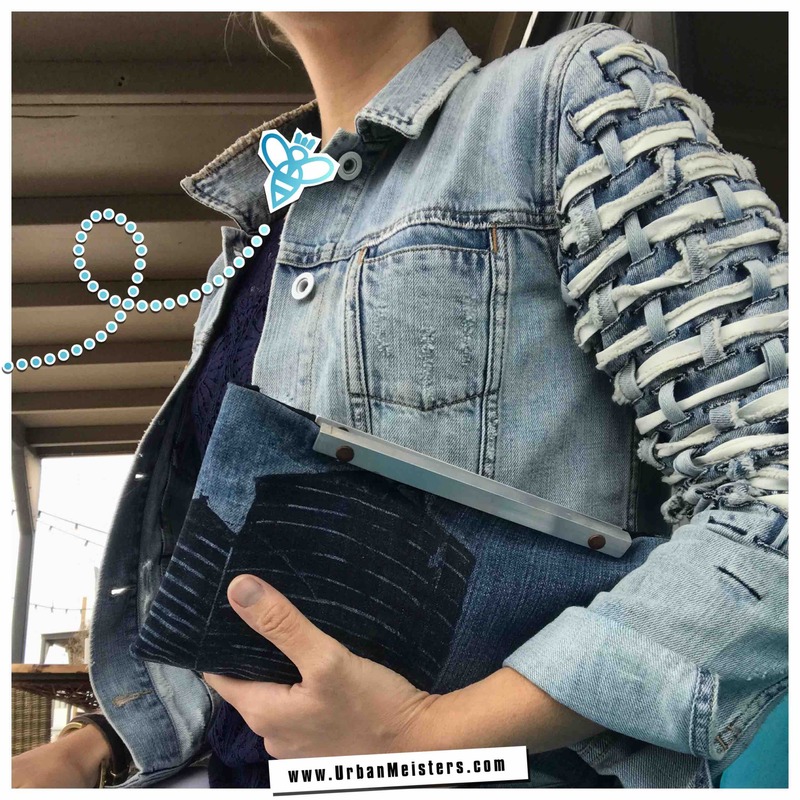 The Denim Days festival unites the true-blue community of denim enthusiasts with over 75 exhibitors, influencers, indigo addicts and prominent supporters from the fashion, denim and art worlds. And for its first New York show, we had our special Green Correspondent Holly E. Brown report live from the event. 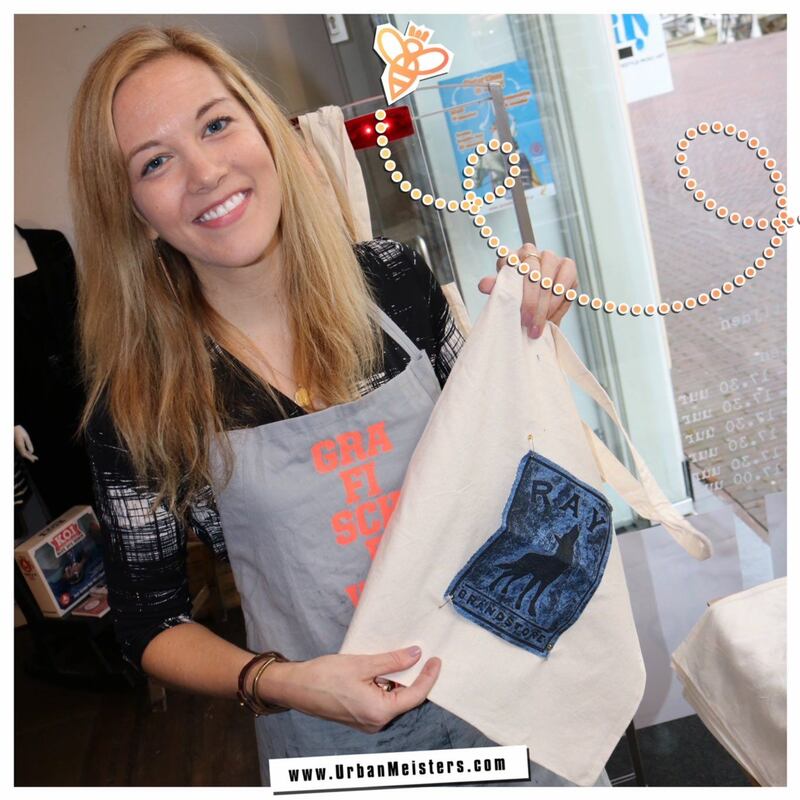 Holly is a Brooklyn based printmaker, art teacher and owner of Clockworks Press™ who works on recycled denim & is soon to launch her signature collection. She’s an artist quite passionate about living green and caring for our world. She’s giving printmaking a sustainable direction by innovating with eco-friendly practices like using less chemicals and recycled materials. 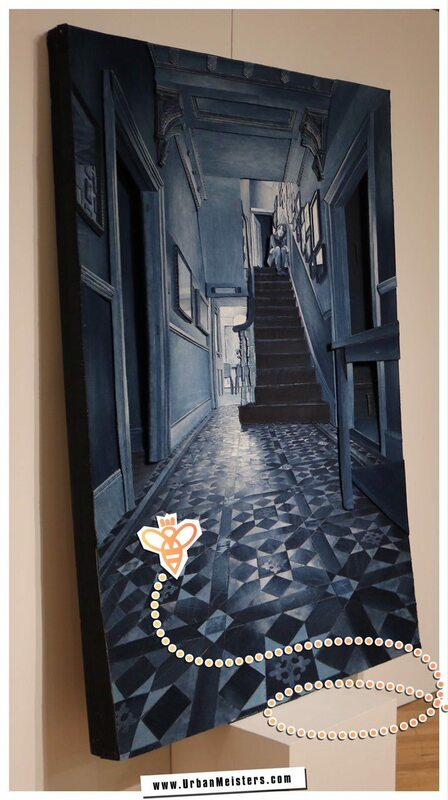 Holly’s prints can be found in the permanent collections of The Library of Congress, Washington, D.C., Yale University, Connecticut and Princeton University, New Jersey as well as in several personal collections internationally. She collaborated with Pulitzer-prize winning poet Charles Simic on various portfolios and was an Artist-in- Residence at Grafische Werkplaats, The Hague (2016) and The Cooper Union, New York (2005). 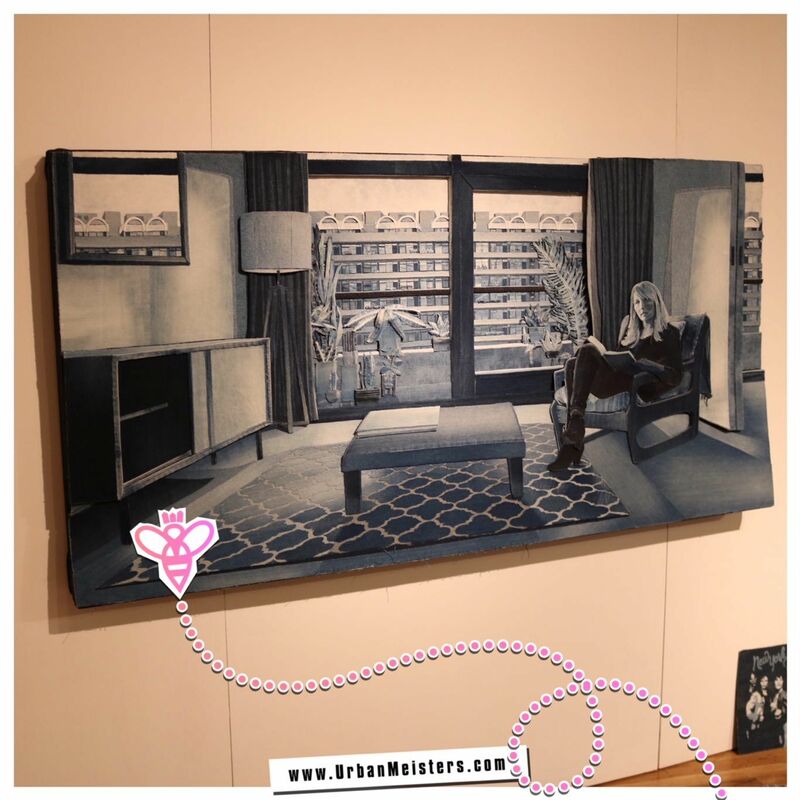 This prolific artist and passionate greenie was our special correspondent at New York Denim Days where she caught all the sustainable action at the world’s biggest denim fair! Here’s Holly’s full coverage of sustainable denim at the fair in her own words. On September 30 and October 1, 2017 the creators of the acclaimed Amsterdam Denim Days brought the indigo obsession state side for the first annual New York Denim Days Festival. Held at the Metropolitan Pavilion, in the heart of New York City’s Chelsea district, the festival paired denim artists alongside established and heritage brands, mills, vintage dealers and workshops to give denim heads and consumers alike a closer look at all that’s happening in the denim industry. As your Urban Meisters green correspondent my goal was to get to the sustainable denim action in this sea of blue. My first stop was a visit to the trifecta collaboration of Officina +39, Berto Industria Tesstile and De Ver Azul. Labeling themselves as A green alliance for an indigo experience between Art and Sustainability, I was very curious to hear more about their goals. They were presenting Recycrom, a revolutionary sustainable dyestuff. I was immediately drawn into the booth by the beautiful paintings being created by artist Juan Manuel. I had the pleasure of chatting with Officina +39’s CEO Andrea Venier about this revolutionary process and its effect on the denim industry. Holly Brown: Can you tell us a bit about your sustainable collaboration here at the first NYDD? Andrea Venier, CEO Officina +39: At Officina +39 we are a chemical development company based near Milan, Italy. We are producing and developing technology for the denim industry from garments. At Officina +39 we are able to reprocess the textile scraps and transform them into colored powder. Today at this moment we are here in collaboration with the 150 year-old denim mill Berto and an excellent Columbian artist, Juan Manuel, his project is called De Ver Azul (Blue View). Juan is here using the chemicals we produced to paint. Denim is his canvas. He is using our chemicals in a very physical way to make his amazing artworks. We feel that the artist should inform the industry and the industry the artist. With our collaboration at Denim Days together with Berto we are promoting Recycrom, a revolutionary sustainable dyestuff. Using our patent pending technology we can transform cellulose textile waste, which is cotton and other fibers coming from the cellulose into a powder. One kilo of this textile waste turns into to one kilo of powder. By creating a powder it means if we are transforming any scraps or post-consumer waste for example red garments we are able to transform it into a red colored powder. This powder then becomes a dyestuff and can be made into a pigment for use in dying, printing or coating. For us it is making the waste completely sustainable and creating in turn a circular economy in which we regenerate waste back into the system. Berto is the first mill to embrace the project with us by using the colored powder to dye once again a fabric in production. Berto also helped us to transform indigo yarn waste into dyestuffs. Indigo was the most difficult to achieve but with our collaboration with Berto we have been able to achieve it. HB: What do you see as the future for this sustainable dyestuff process in denim? AV: What we are thinking in the future at Officina +39 is to establish projects with denim industry brands that would give us their own textile waste and then in turn they can explain to their consumer that they are using their own textile waste to dye their garments. We can create paints, dyes, and inks from this powder. As we already know the dyestuff industry is one of the most polluted in the world. So we hope to make a more circular economy model with Recycrom for the denim industry. HB: Is the process cost effective? AV: At the moment the cost is higher because we are still on a small scale but eventually it will be equal. We have on an industrial scale we have it will be more or less the same cost for a brand. 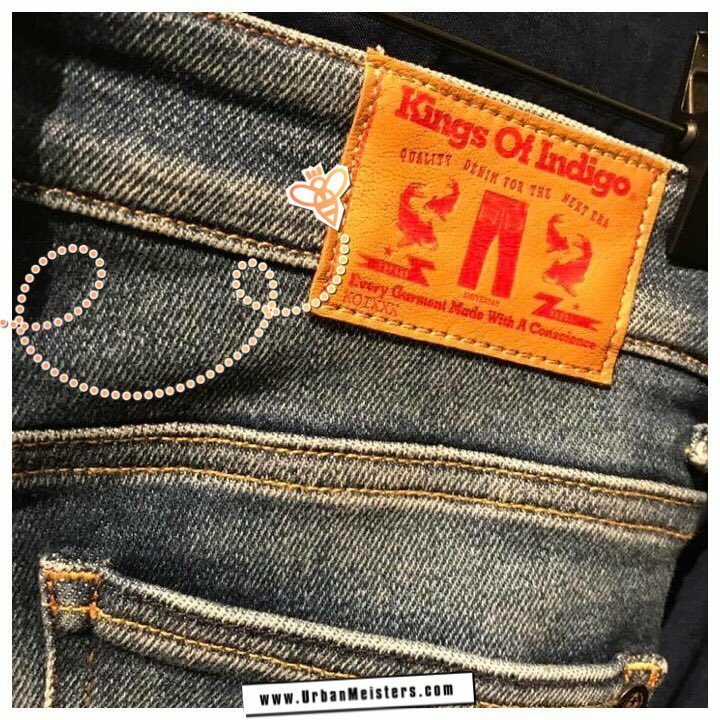 After speaking to Andrea and hearing about what was happening on the industry side I couldn’t wait to venture over to Kings of Indigo, a Dutch denim brand known for it’s commitment to sustainability. Also known as K.O.I. ®, this influential brand focuses on design, development and distribution of sustainable denim, tops, and accessory concepts. Already using recycled cotton and leftover fabrics I was excited to hear what founder Tony Tonnaer had to say about sustainability. HB: How did Kings of Indigo (K.O.I. ®) get their start with regard to sustainability? Tony Tonnaer, founder Kings of Indigo: Before I started at Kings of Indigo (KOI) I was the CEO for Kuyichi, the first sustainable Dutch denim brand. I’d been doing that for seven years before I started my own company. So I did that already since 2002. So when we had the idea in 2010 to launch K.O.I. ® it was normal to do it in a sustainable way and try to get to the next level of sustainability and design by making it better than what we did in the past. For me it was quite easy. HB: How are you pushing K.O.I. ® to the next level? TT: With K.O.I. ® we are developing more variety in our fabrics and using more blends such as organic cotton with hemp, organic cotton with linen, organic cotton with tencel, and 100% linen. We try to use less and also quality wise we try to make a product that lasts longer allowing the consumer to buy less. At K.O.I. ® we are doing a lot with innovation on fabric construction and patterns. I think we are much more ahead in fashion ability than what I used to do before. The more we can innovate the better. We must work with our suppliers to be at the front of what’s happening. HB: How have you managed to stay so small in this large arena of the Amsterdam denim industry? TT: I think you have to stay close to what you believe in and the design concepts are still the same as they were six years ago. It is also important to look at what’s relevant in the market. I finished the day in conversation with the prolific British artist Ian Berry. 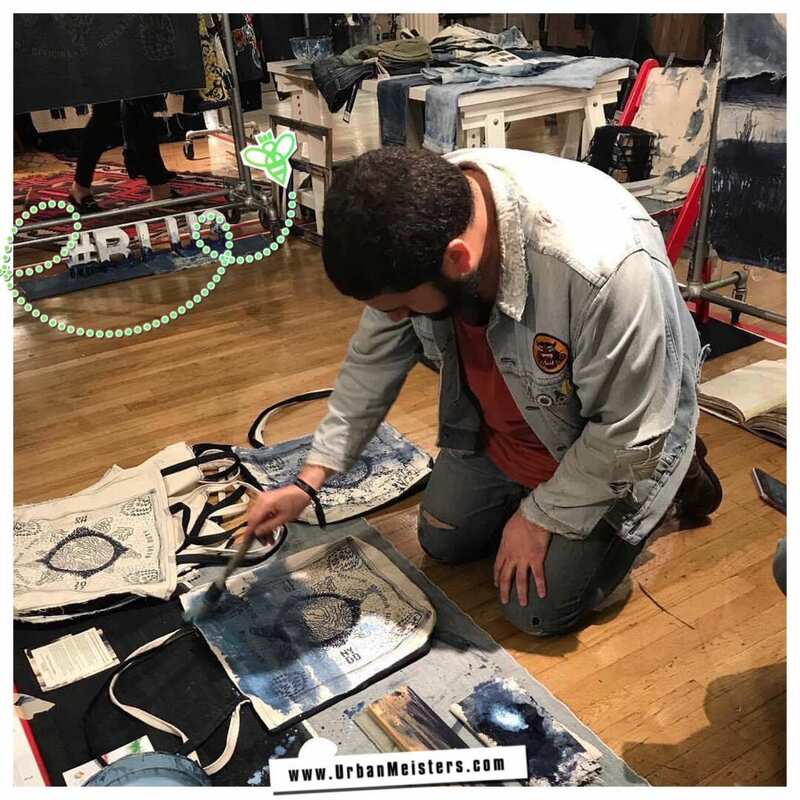 With denim as his canvas Ian creates incredible scenes using no bleach, no paint as he states, “only denim.” Through incredible layering of values and textures Ian creates amazing depth that pulls us into scenes of urban living. I was so happy to finally see them in person, as they really need to be viewed live. I had the sincere pleasure of sitting down and speaking with Ian about his artistic process in regard to sustainability. 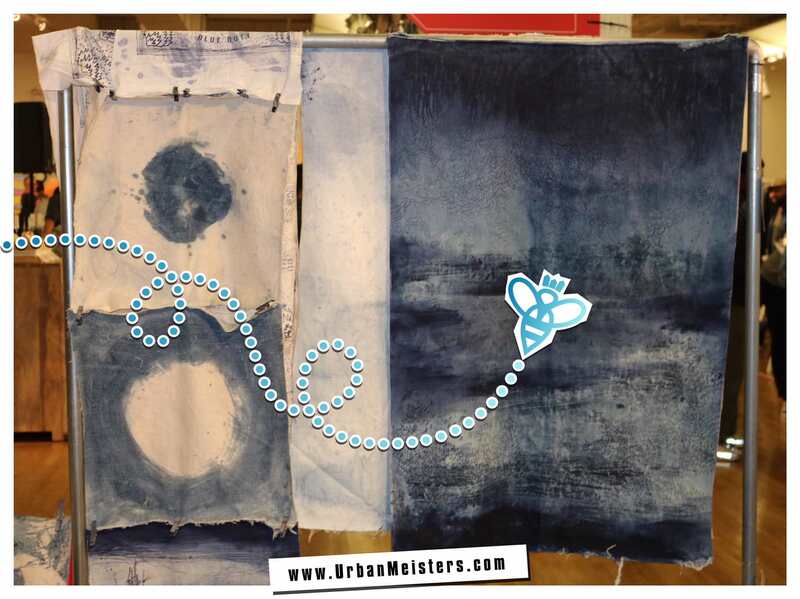 HB: What is your view on your art in regard to sustainability and recycled denim? Artist Ian Berry: I’m using denim as I portray contemporary life. What is more the material of our time, than denim? Its dualities also lend itself to portray our lives now in both the good and the bad. I can’t deny the hands that have touched denim before me are not in my mind in the studio, nor the effects denim can have on the world. While many will say I am recycling, it’s a tiny, tiny percentage of the denim in the world. Perhaps, people can think of recycling, but what I am doing is not game changing. That is why I am now working with partners who are setting the agenda with sustainable goals, which, by the nature of the industry is not easy, but we have to try. It was fantastic to witness the sustainable denim initiatives in the denim industry; its brands and passionate artists working together to help us all live our best green life. Thank you everyone for speaking with me and sharing your incredible insights with UrbanMeisters. My take away for you is to buy less, learn about where your clothes come from and rarely wash your denim. I am incredibly grateful to the entire team at New York Denim Days for your sincere hospitality and welcome. See you all next year for more indigo love with a green approach! Thanks Holly for this fantastic report on sustainable denim developments from New York Denim Days. Readers stay tuned for a full feature on Holly’s amazing work in the area of sustainable art and till then you can follow Holly’s artwork on her website at www.hollyebrown.com and on Instagram and Facebook @hollyebrownart. And we’ll leave you with a sneak preview of Holly’s awesome work below! Sustainable denim printing clutch bag designed by Holly Brown for Clockworks Press™ © 2017, jacket by Stieglitz for Denham.